← Basic Income: an idea whose time has finally come? New numbers from the boffins in the CSO again make a mockery of how we measure economic activity. Sure, on the face of it, last year’s 5.2% GDP growth sounds more reasonable than the make-believe 26.3% recorded in 2015. Remember that prompted Nobel prize-winner Paul Krugman to call out Ireland’s ‘Leprechaun economics’? Over the years, many economists in Ireland have argued that GNP – which strips out the repatriated earnings of multinationals – is a better measure of our economic progress. According to this measure, growth halved from 18.7% in 2015 to a still-stellar 9% in 2016. But, even the most sunny-sided economists would struggle to claim with a straight face that this is a good indicator of Ireland’s true rate of economic growth. Let’s take a closer look at the data for the last three months of 2016. According to the CSO, investment almost doubled from the previous three months to reach €29bn. At 43.5% of GDP for the fourth quarter, Ireland appears to have a similar investment rate to China. In reality, of course, it does not. We see a clue as to what happened in the trade data. Imports also surged to a record quarterly high of nearly €78bn, a little less than exports, meaning Ireland’s trade balance fell from €18.6bn in the three months to September 2016 to only €1.2bn over the final three months of the year. 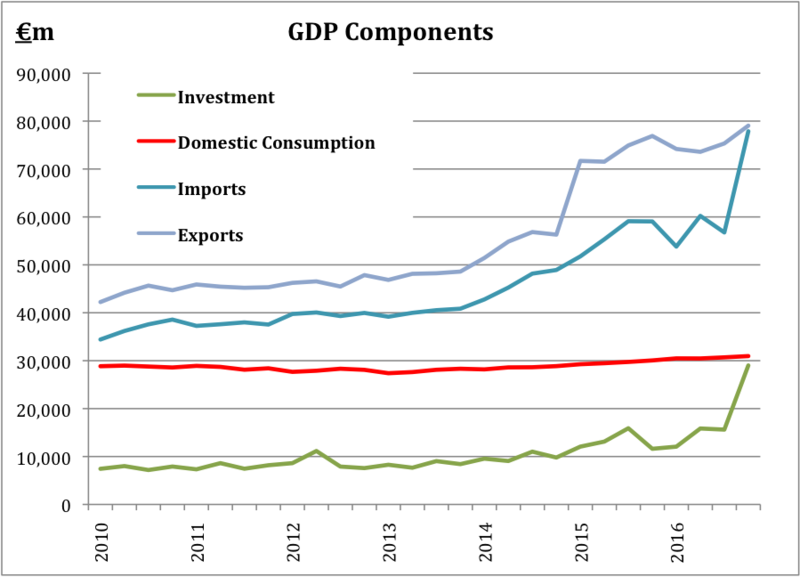 In the calculation of GDP, this meant the surge in investment was more than wiped out by a corresponding increase in imports. These freak figures have largely been explained by the redomiciliation of multinationals to Ireland. What happens is a multinational decides to relocate to Ireland to benefit from our notoriously attractive corporate tax regime. Through an accounting and statistical sleight of hand, this is recorded as an investment in Ireland, but often also as an import of intellectual property from the multinational’s previous home country. Thus, little or no cash may change hands. Even if some jobs are created in the host country, these pale into insignificance compared to the amount of money in play. This is not productive investment as we conventionally understand it. Neither is it a new phenomenon. We know well that big corporations like Apple Inc. have long had big operations in Ireland, with huge benefits in terms of tax avoidance. The phenomenon has accelerated in recent years, particularly among US firms. This explains in large part Ireland’s too-good-to-be-true growth rates for 2015 and, to a lesser extent, 2016. But, this could be the last sting of a dying wasp. Global rules on corporate taxation are being tightened, while new US Treasury rules introduced in 2016 to scuttle Pfizer’s mega-move to Ireland have already made such tax inversions more difficult. What, then, explains the spike in Irish investment and imports during the latter part of 2016? Could it be that the election of Donald Trump on an explicitly protectionist platform caused a rush to the exits before the rules are tightened further? Or, perhaps US-based multinationals take Trump and Congressional Republicans at their word when it comes to corporate tax reform. It is expected that the corporation tax rate will be reduced significantly from its current level of 35%. There is also speculation that big US corporations hoarding cash overseas will be offered, essentially, a tax amnesty to repatriate past profits, in the hope that these funds will be used to fund investment domestically. Late 2016 and early 2017 could be the last chance saloon for US firms wanting to switch their tax headquarters so that they can benefit from any such amnesty in the future. Over the medium to long term, one would expect increased repatriation of US multinationals’ profits to show up in Ireland’s national accounts as big reductions in GNP. But, again, the negative impact on employment and productive investment in Ireland may be much less than these headline numbers would suggest. If we can’t trust GDP or GNP to tell us how our economy is doing, what can we trust? Some have suggested using a hybrid measure somewhere between these two. A simpler approach is to focus on domestic consumption. If we ignore exports and imports, investment and multinationals’ repatriated profits, we are left with household and government consumption. These tend to be less volatile, and are probably a better proxy than either GDP or GNP for the evolution of living standards in the country. So what do these numbers say? Even though the wider economy, measured by both GDP and GNP, started growing again in 2013, growth in public and private consumption only turned positive in 2014. Domestic consumption increased by 2.6% in 2014, 3.7% in 2015 and, according to yesterday’s numbers, 3.4% in 2016. This is closer to the level of growth suggested by the labour market. This entry was posted in Articles for thejournal.ie, Mexico. Bookmark the permalink.